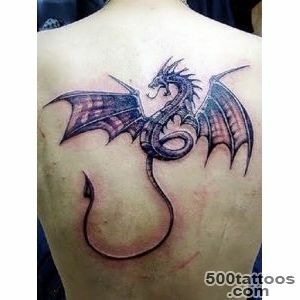 Dragon - is a classic tattoo which is popular among young women and men. 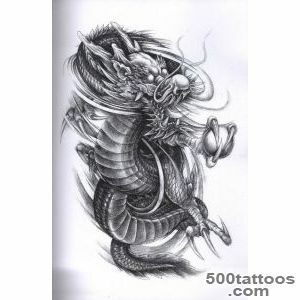 Image of a dragon on the tattoo shows the profound influence that the Chinese and Japanese culture has a tattoo on the west for about two centuries . 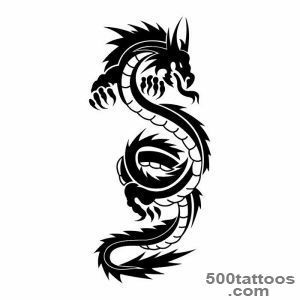 In the East, the dragon is a symbol of four elements : Earth , Wind , Fire and Water , as well as the four cardinal points : North,South, West, East . 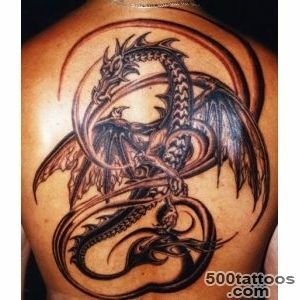 Dragon - at the same time symbolizes the water, the earth , the sky and the underworld . 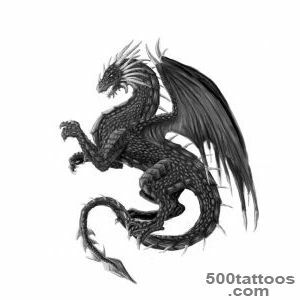 About dragons known since ancient times , this is a huge , fire-breathing winged creatures , reminiscent of prehistoric animals that lived on earth millions of years ago. 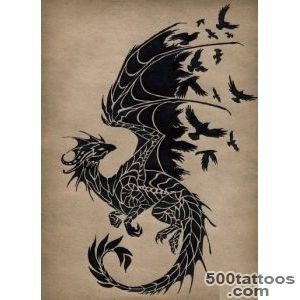 But dragons have appeared thanks to human imagination . Maybe,the basis of its appearance , the findings were in China and other countries , the remains of giant reptiles and dinosaurs . 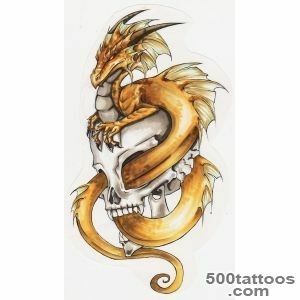 Different people may have the opposite symbolism regarding dragons . These mythological creatures in China was considered a symbol of imperial power , and supernatural powers . Dragon called god of rain ,so often found his picture surrounded by looming storm clouds . 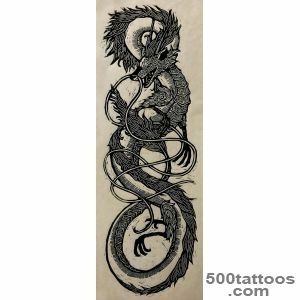 Dragons are considered the ancestors of the Chinese people , because they are firmly rooted in the legends and myths of the Chinese culture . 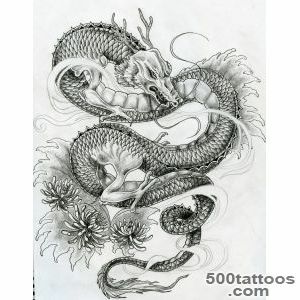 One of the Japanese emperors claimed to be a descendant of the most powerful and immortal dragons . 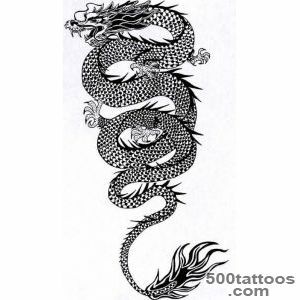 Therefore, nobody will be surprised by the factthat on the clothes of Japanese emperors depicted dragons , symbolizing protection of the dragon and the power of the emperor . 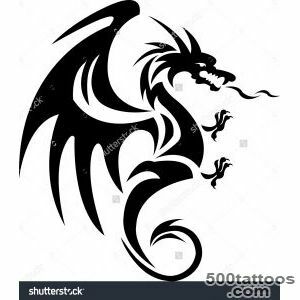 As mentioned above, the dragons symbolize the four elements , from here take their origin myths about the rule of the dragon in the water , air , earth and fire . 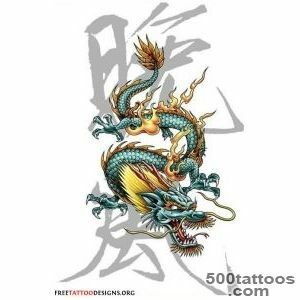 Dragon for each of the elements has its exclusive features .Fire-breathing dragon from the Chinese associated with lightning , thunder and rain , it was considered a symbol of fertility . 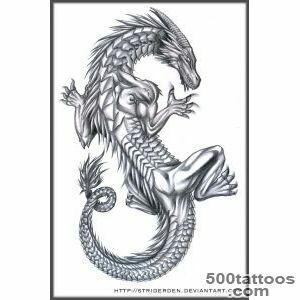 water element Dragons felt protectors and patrons of lakes, streams , rivers and private pools . 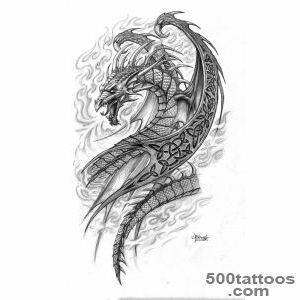 Along with the dragon tattoo , symbolizing the elements , also known legends and myths about specific dragons , which, for example , to someonethen served and guarded the treasure . 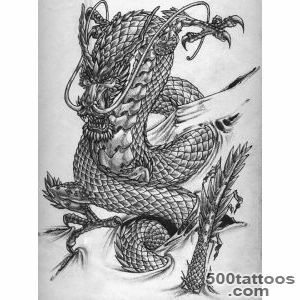 In Chinese and Japanese culture, there are many stories that tell how after a long journey , many being turned into a dragon . In Japan, you can often hear the story of the fish and Koi carp , which turns into a dragon , at the end of his difficult and dangerous path.Dragon was assigned to one of the main roles in the Japanese and Chinese people's beliefs , as well as the Taoists to the emergence of Buddhism . 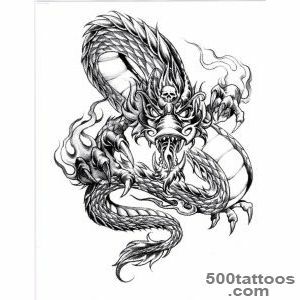 In Buddhist art Chinese dragon appears only in the ninth century , where he plays the role of protector of the Buddha and Buddhist sacred laws. 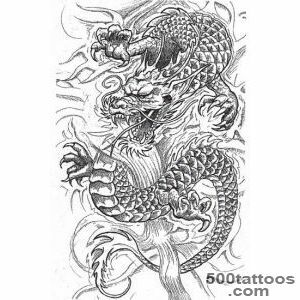 The image of the dragon can be seen on the gravestones , over the gates of temples ,which served as protection against evil spirits . 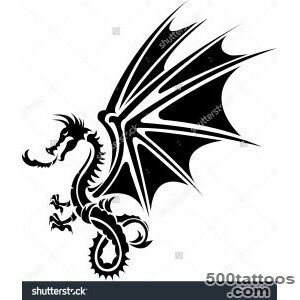 In the ninth century , there are images of dragons , which are becoming popular , such images are made with the help of mascara . The illustrations , the dragons were scaly , long body , paws with claws , sharp teeth , small horns and big eyes under bushy eyebrows . 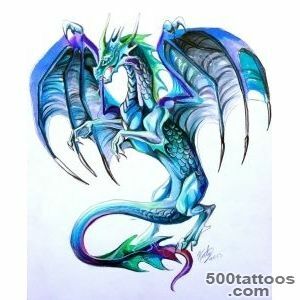 If the dragon is portrayed wingless ,he symbolized the rainbow. 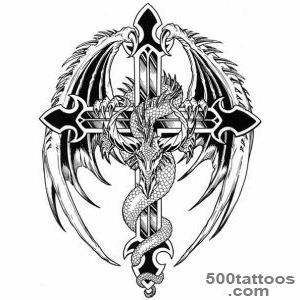 In Western culture , dragons signified evil. 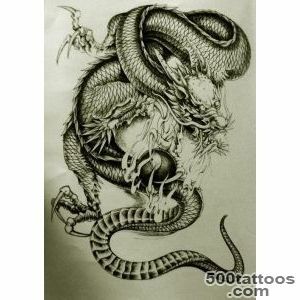 Dragon compared with the Paradise serpent - tempter , which has become a source of sorrow to mankind . Much later appear descriptions of battles with various saints fire-breathing dragon , for example , the story of the battle of St. Michael .You can also find images from the battle with the sea dragon of St. George, where George, England's patron saint , depicted winner. 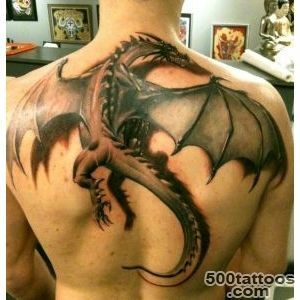 In Roman and Greek civilization , during the battles , warriors wore dragon tattoo as a symbol of terror . 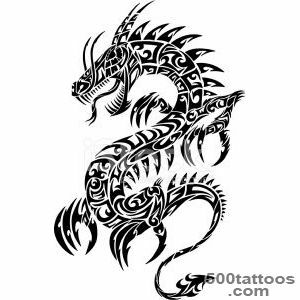 Dragons depicted on the Viking ship ,Celts associated the dragon with sovereign power . The Anglo-Saxons depicted a dragon on its standards . 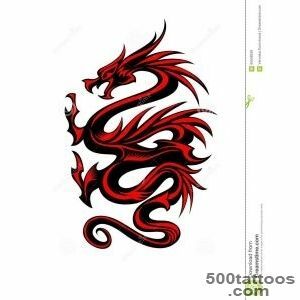 In Wales , until today, the Red Dragon is considered a national symbol . 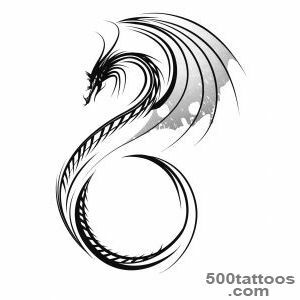 Wherever there were dragons , his power and sovereign power was used as a defense or as an evil that must be defeated .The supreme criterion of human endurance and courage , considered defeat fire-breathing dragon . 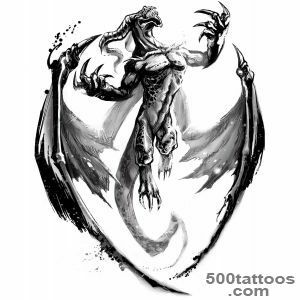 There are many legends that tell of the heroes of ancient Greece , battling dragons . 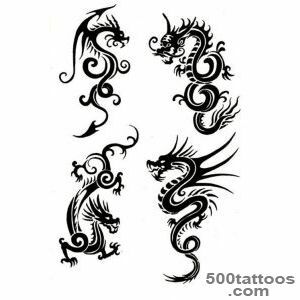 Today we can see the different tattoo dragons that show their different aspects : heavenly , protective or monstrous . 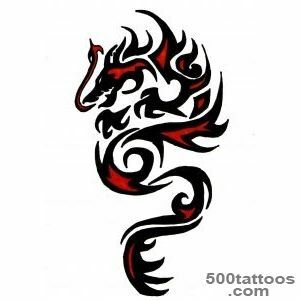 Chinese astrology ,prophesies a man who is born under the sign of the dragon , to be a leader in life. 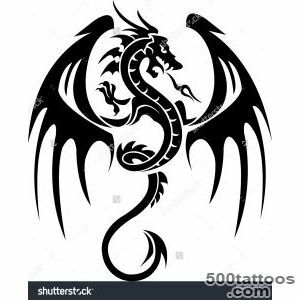 According to Feng Shui , to reach heavenly heights , the person needs to put a coin with the image of the dragon , which symbolizes yang , near the coins , which depict the phoenix , which symbolizes energy Yin and responsible for family well-being . 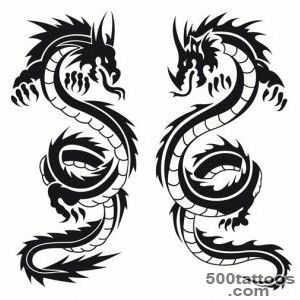 Dragon tattoos ,It symbolizes magic , nobility , strength, imagination and conversion , loyalty , perseverance , the ability and the strength to go beyond the ordinary . 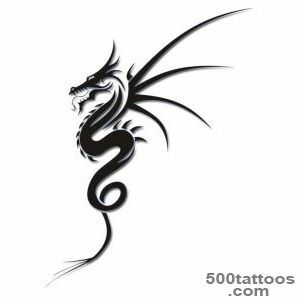 Also, very often , the dragon tattoo is a symbol of power and strength , a symbol of magic and spiritual qualities . 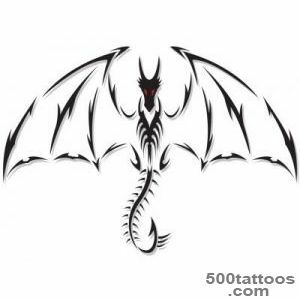 The dragon is the best known mythological creatures in the world. 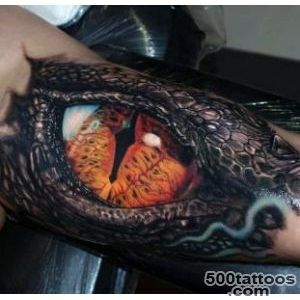 One of the reasons,which make the dragon tattoo in demand - it is saturated with colorful shades and bold design . 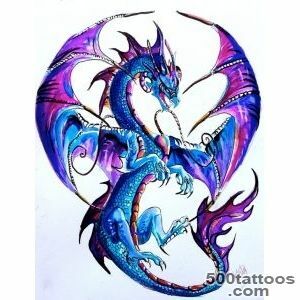 There are a variety of ways images of dragons , because of this , it is very easy to create a creative , creative drawing . 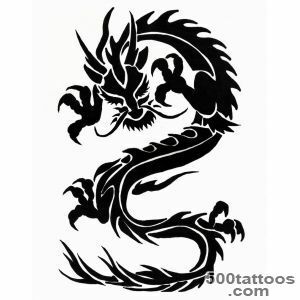 Known designs two kinds of dragon tattoos , which are used more often. 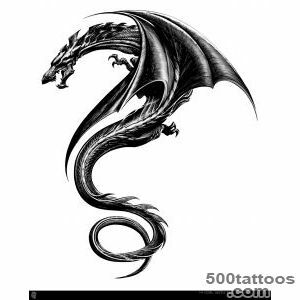 First, the Western dragon ,with thick scaly body , wings ( which are like the wings of a bat ) and a long neck . 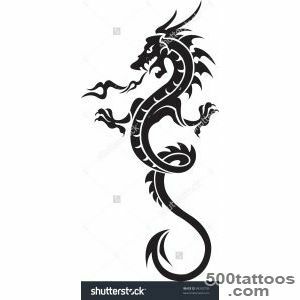 Secondly, the Oriental dragon , with a body like a snake and no wings . Popularity of the dragon of the West is due to a large number of mythological stories , and not due to the presence of deep meaning . Although they can have a profound significance. 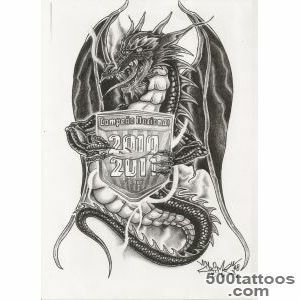 For example,Celtic Dragon " circle of life " , displays the cyclical life, and expresses pride in its historical roots . 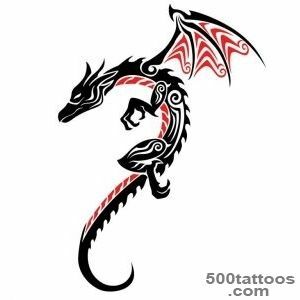 A striking example can be considered a red dragon , the national symbol of Wales. 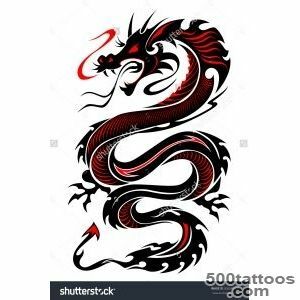 Regarding the eastern dragons , they represent something more than just an ordinary snake-like creature .Oriental dragons symbolize the natural elements : fire, water , earth and wind. They are neither good nor evil , but they often symbolize the forces of nature , which can be positive or negative . 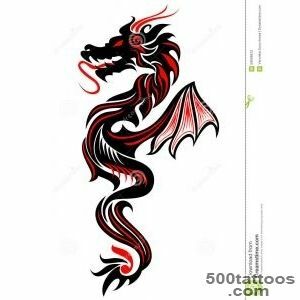 Most tattoos depicting dragons make colorful and bright , but sometimes they are carried out in shades of gray or black.The combination of red and black , is a great option , execution of the tattoo , which is often used in flame tattoos . 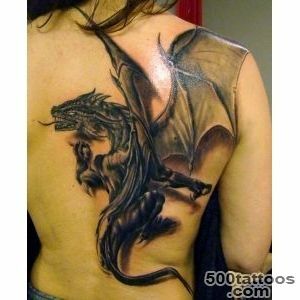 Given the volatile nature of dragons and create a scene in which the use of different creatures . 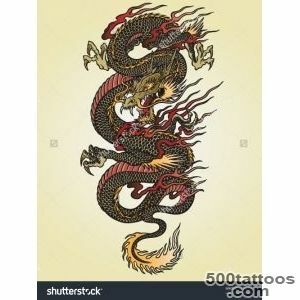 For example, image design dragon fish Koi. A Koi fish , is considered a symbol of wisdom , virility and longevity .The fish rises to the top of the waterfall , and in the end his campaign becomes a dragon . 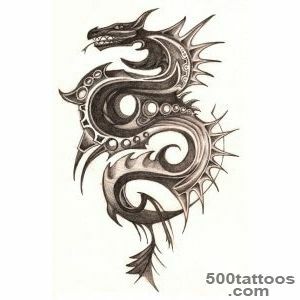 Such an image can be a simple pattern that shows a creature resembling a fish , after a dragon . 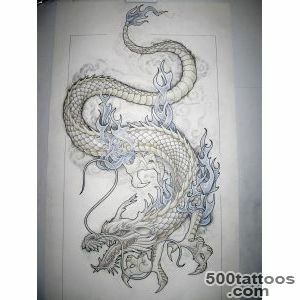 Sometimes there are also complex drawings , which depict the transformation of fish into a dragon . 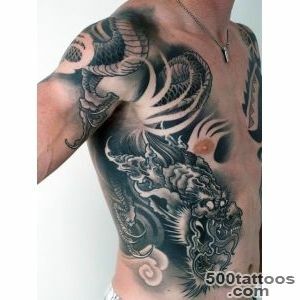 Background in these tattoos can also be varied,as well as diverse images of dragons themselves . For example, use the colors in the image , flame , mountains or medieval fortress from which the cave dragon appears . 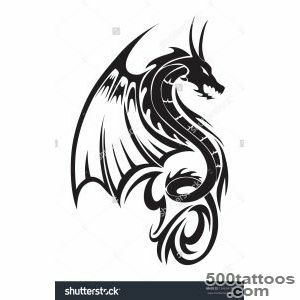 Tattoo dragon , colored or black , which is applied to a small area of ​​the body and takes up most of the body - regardless of design , is a symbol of nobility , strength ,magic and superiority over the commonplace . 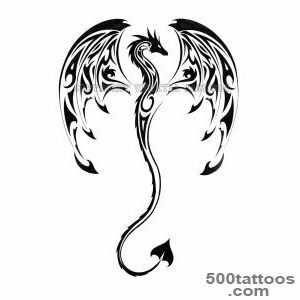 Dragons are often used as an expression of what we think about ourselves , or what we would like to see yourself - free and strong .